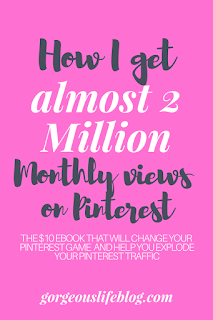 How to explode your Pinterest traffic: The $10 ebook that will change the game. True life: I am obsessed with Pinterest. I first began using the app over 5 years ago when I was pregnant with my second child. I became obsessed with it because there were so many DIY things to do and so many interior design ideas and so many fashion ideas oh my I just fell in love. 5 years later, Pinterest is still my favorite app because it adds value to my life. I can always learn something new or see something that inspires me on Pinterest. After years of using the platform, I discovered the tricks to gain traffic to my Pinterest. It took me years to learn these though, and I wish I knew them when I first started. So I created an ebook that will help you increase your page views and following as well! Of course I wanted to make it super affordable. You can purchase the $10 ebook on Etsy here !! !